Driving abroad can be a stressful activity, made more so if you find yourself involved in a car accident. Understanding how best to prepare for safe driving abroad, cope at the scene of a car accident abroad and make a claim after a car accident abroad should help you feel more confident about driving in other countries. Once you decide that you will be driving abroad, begin preparing before you ever leave home. Make sure that you have your driving licence as well as an International Drivers Permit, available from the AA and the Post Office. If you plan on bringing your own car then make sure to pack all pertinent car insurance documents as well as a "Green Card" or International Certificate of Motor Insurance confirming at least third party insurance if you are travelling in Europe. Your insurance company may also be able to provide you with a European Accident Statement (EAS) form to keep with you as you travel. Having your vehicle serviced, packing a spare set of car keys and bringing first aid and emergency supplies are good ideas as well. Finally, familiarise yourself with local driving laws, road conditions and travel routes in the country to which you are travelling and copy down the contact information for your insurance or breakdown cover helpline should you need them. If you are renting a car, select a make and model with which you are familiar and look over your insurance options prior to leaving home. 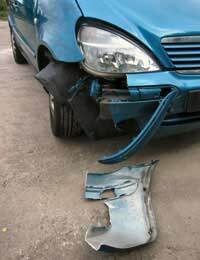 If you are involved in a car accident abroad, regardless of whether your are at fault, a driver or a passenger, do not leave the scene of the accident. Stay calm and check to see if anyone is in need of emergency medical assistance. Call the local police and/or emergency services and request an English speaking representative, if needed. Contact your own motor insurance company for further instructions. Write down the make, model, colour and registration plate information of the other vehicles involved in the accident. Take down the names and contact information of others involved in the accident or any witnesses. If your accident occurs in Europe, fill out and sign the European Accident Statement when you are certain of what this legally binding document says. If you were driving a rental car, contact the rental agency and find out if there are any specific instructions you must follow. Only leave the scene of the accident when told you are allowed to do so. The 4th and 5th European Union Motor Insurance Directives have made it significantly easier to claim for personal injury compensation following a car accident in a European Economic Area (EEA) state. Even if an accident occurred outside of the EEA, a British solicitor may still be able to make a claim for you. If you are interested in making a claim direct to your motor insurance company then contact them directly for further information. Otherwise, contact a solicitor to find out more about what and when you can act to make a claim after a car accident abroad. Hopefully this is a situation you will never find yourself in, but it pays to be prepared anyway before you decide to drive abroad.